As the temperatures reach below zero and severe frosty conditions have been forecast, Scottish Water is reminding homeowners, tenants and business owners to follow their simple winter code of guidance in order to properly protect their pipes and ensure that the water cycle runs as smoothly as possible. The winter campaign put together by Scottish Water is recommending a three point guide which will help residents and business owners avoid the inconvenience, stress and cost of not taking preventative methods to avoid burst and frozen pipes after extreme weather conditions. The winter code advises people to take action and heat, insulate and protect their properties. The campaign is supported by an informative leaflet which is available to download from the Scottish Water website. It will provide you with guidance on which steps to take to avoid your pipes bursting or freezing over, how to locate your stop valve, what to do in an emergency situation and how Scottish Water can help. If you do end up with a plumbing emergency, more information on how you can deal with this can be found at https://www.emergencyedinburghplumber.co.uk, so that may be worth checking out if you are unfortunate enough to suffer from a problem such as a burst water pipe. The Chief Operating Officer of Scottish Water said that anyone who has ever returned home or to their place of work to be greeted with freezing water all over their furniture knows only too well the stress and damage that a burst pipe can result in. He added that the company wishes to work with their customers to make sure everyone is prepared for temperatures to reach below zero. Severe frost has also been forecast for some parts of Scotland. 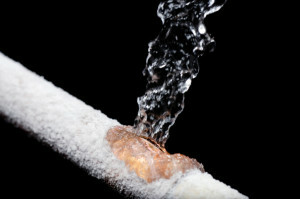 Preventing pipes freezing will also help ensuring that the water cycle never stops working. A spokesperson for Scottish Water spoke of what an important resource water is and how the company puts a lot of working into keeping it flowing. He stressed that water pouring back into a drain because of a burst pipe can cost a lot of money for the company, not to mention problems for the customer. To find out more about keeping your pipes safe in winter contact Scottish Water.